Fig. 2: Movement of male titillators (t1, t2) and female genital fold (fgf), revealed by X-ray imaging. Male genital organs are among the fastest evolving morphological structures. However, large parts of the male’s genitalia are often hidden inside the female during mating. In several bush cricket species males bear a pair of sclerotized genital appendices called titillators. By employing synchrotron-based in vivo X-ray cineradiography on mating couples, scientists from the Humboldt University in Berlin and KIT were able to visualize titillator movement and spermatophore attachment inside the female. Titillators are inserted and retracted rhythmically. During insertion the titillator processes tap the soft and sensillae-covered dorsal side of the female’s flap-like genital fold, which covers the opening of the female’s genitalia, without tissue penetration. Titillators thus appear to be initially used for stimulation, while subsequently they may apply pressure that forces the female’s genital fold to stay open, thereby mechanically aiding spermatophore transfer. In figure 2 (A) the male titillators contact the genital fold (yellow, the solid line indicates the aperture of the fgf) and begin to push it downwards (green arrow). (B) The genital fold opens wider (the slope of the yellow line becomes steeper), while the titillators push it downwards. 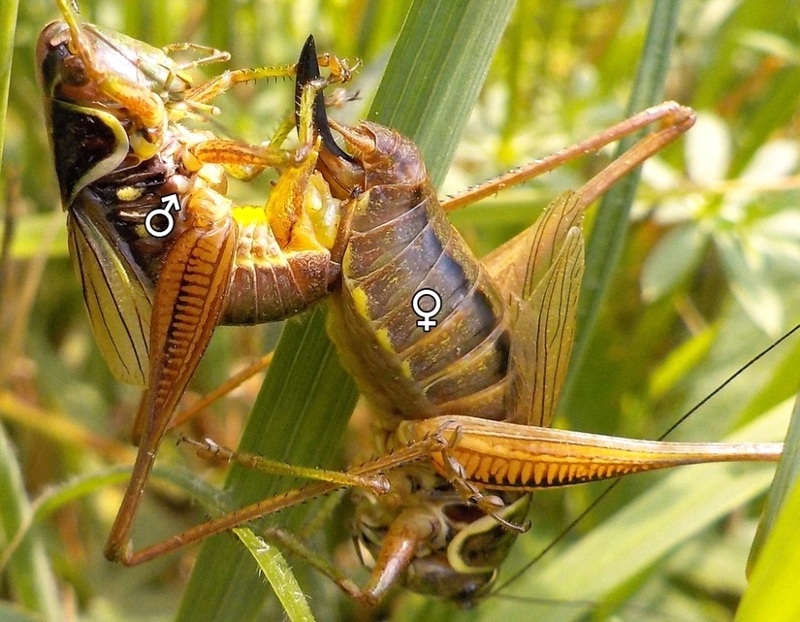 Concurrently the male’s phallobasis (pb, purple) contacts the female’s ovipositor (o). (C) The titillators are retracted (green arrow) and the female’s genital fold moves upwards to its initial position (yellow arrow, the slope of the line decreases). Nadja C. Wulff, Thomas van de Kamp, Tomy dos Santos Rolo, Tilo Baumbach & Gerlind U.C. Lehmann (2017): Copulatory courtship by internal genitalia in bushcrickets . Scientific Reports 7: 42345; doi:10.1038/srep42345.